Happy December peeps! I can’t believe it’s been over two weeks since my last post – I’ve definitely missed it but it doesn’t feel like it was that long ago either? The reason I’ve been M.I.A. lately was because I went to Italy for just under a week, and it was magical! I’m currently sharing a ton of pictures on my Instagram from this recent adventure and look forward to getting lots of Italy content ready for the blog throughout December… but for now, I’m sharing a good old outfit post. By social media standards this outfit is from aaaages ago as these pictures were taken in October – thankfully I can report that it’s 100% relevant as I’m still rocking this kind of ensemble now (Looking back, I actually overdressed for that day as it wasn’t that cold and I could have pulled off something not as cosy). Coat, Red Herring at Debenhams (available here). Top, Zara. Trousers, Vero Moda (available here). Bag, Skinny Dip London (seen here). Boots, Oasis (seen here). Beret, Topshop (seen here). Earrings, hand-me-downs from my mum. Necklace, ASOS. Ring, Accessorize. 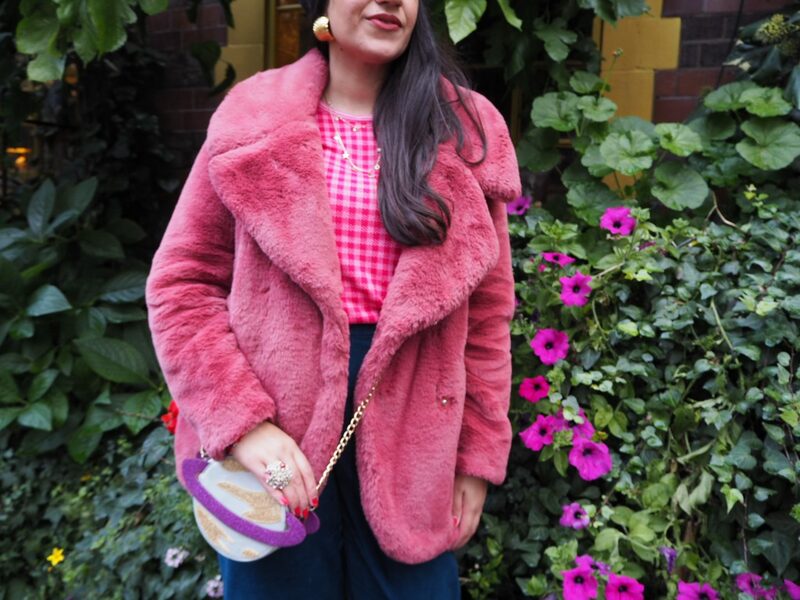 As well as a lot of ‘inspiration’ from the boyfriend, who mentioned “That Seventies Show” and made time machine jokes throughout the day (banter is a language of love in our relationship), “Pimpin’ in pink” was one of the many catchphrases I came up with when thinking of how I could describe this look. It’s funny how I’ve always considered the Seventies to be my least favourite decade in terms of style, and yet, well, here I am, potentially looking like an extra from “That Seventies Show.” Fashion, am I right? But what has really been a big step out of my comfort zone has been these trousers. I really don’t know what happened to me! Corduroy was something I loved to hate, and yet these trousers have taken my breath away. Having said that, what really drew me in was the cut and colour – NOT the texture. 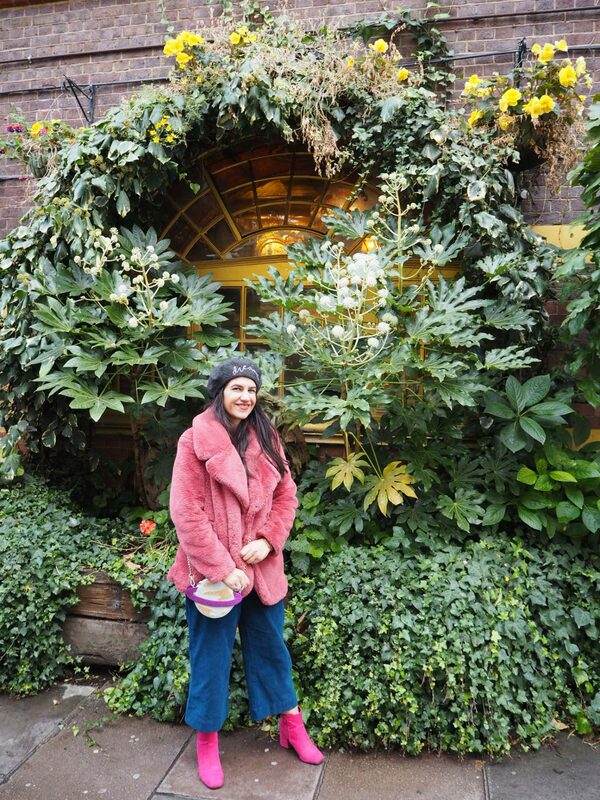 Having these corduroy wide-legged trousers has been such a fun change in my style and I am absolutely loving them. And as someone who used to love wearing baby pink and mint back in the day, this feels like a very grown-up, kinda sexier version of that. 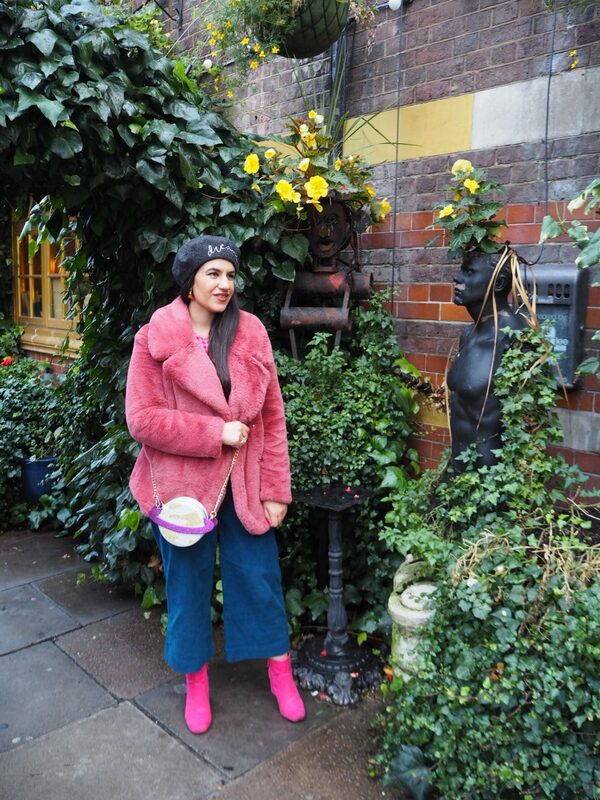 I dug out my pink booties from Oasis – in the same way that a few years ago I would never have worn wide-legged trousers, I would never have teamed boots with trousers. But I kind of love how cropped wide-legged trousers look with ankle boots – again, very seventies! know how the ankle-baring is pretty weird and awkward, but I’m digging it and have committed to letting my ankles get chilly for the next three to four months. I wore this pink knitted top from Zara that I bought over the summer – I think I should have returned it as I don’t think it suits me, but I like how it looked with these trousers. 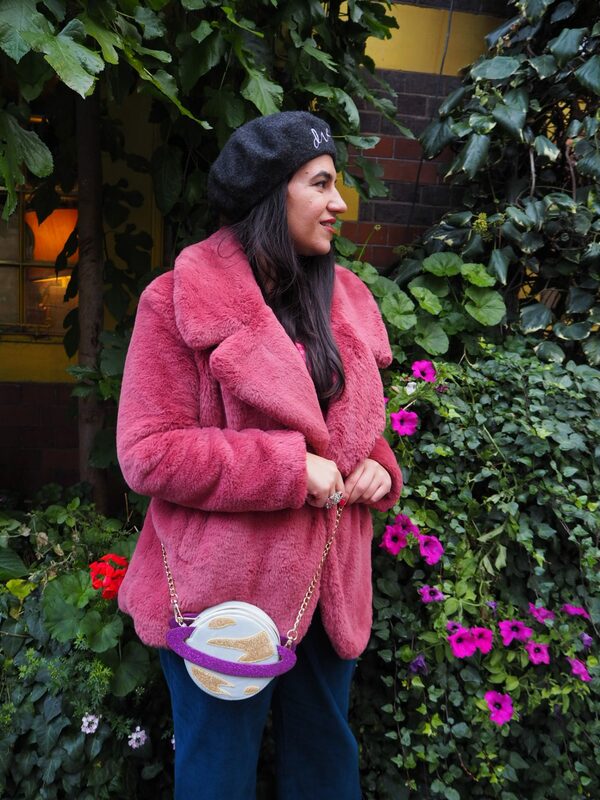 To finish off the look, I dug out a few more oldies but goodies – my ‘Dreamer’ beret from Topshop (from last winter), my little Saturn bag and this super old Dior-esque ring from Accessorize. 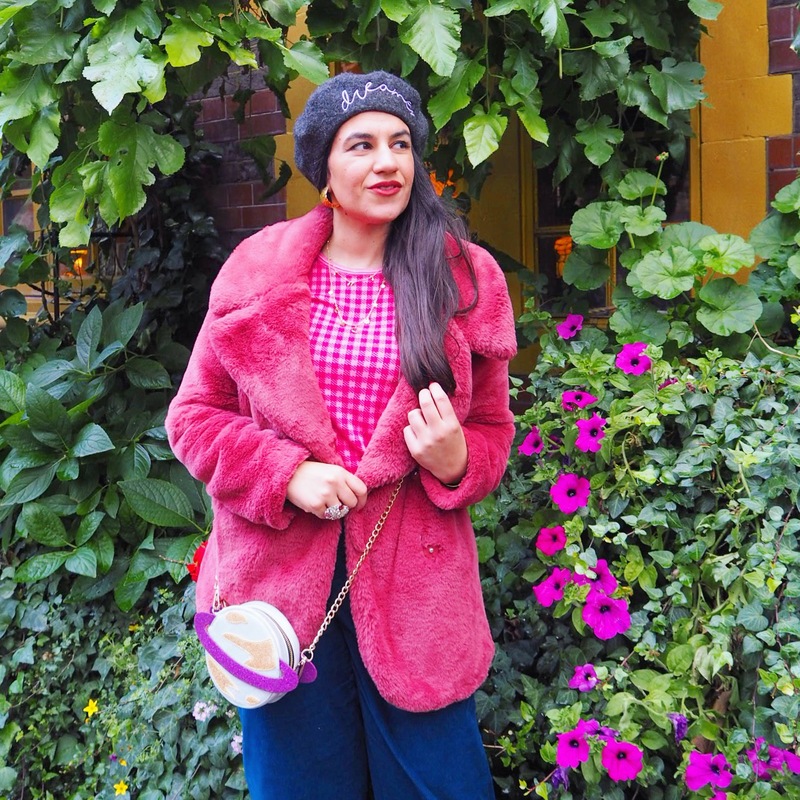 I am trying to shop less and wear more – it’s so hard when you have a fashion blog and love styling, but I love rediscovering pieces that I used to love! 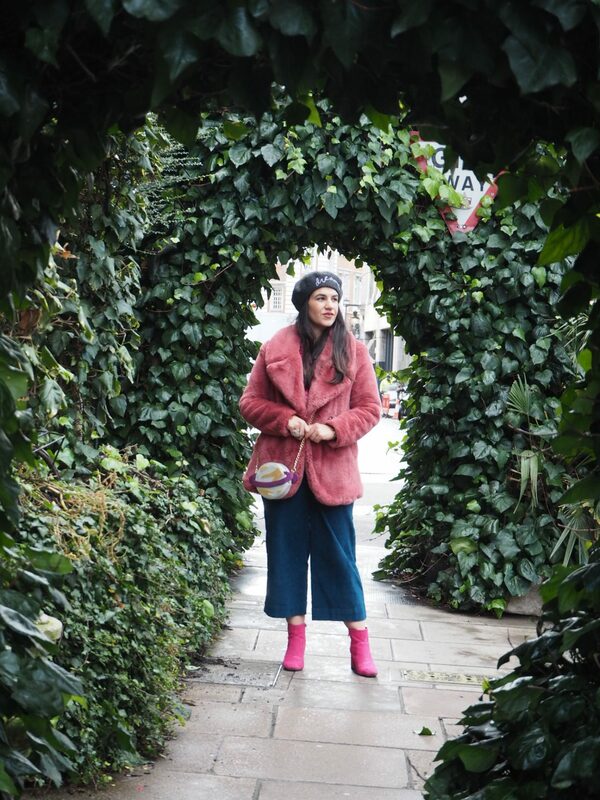 Cosy coat + cool trousers + ankle boots = a formula that’s proving to work for me. So yes, this is one of my go-to outfits for Autumn/Winter ’18. 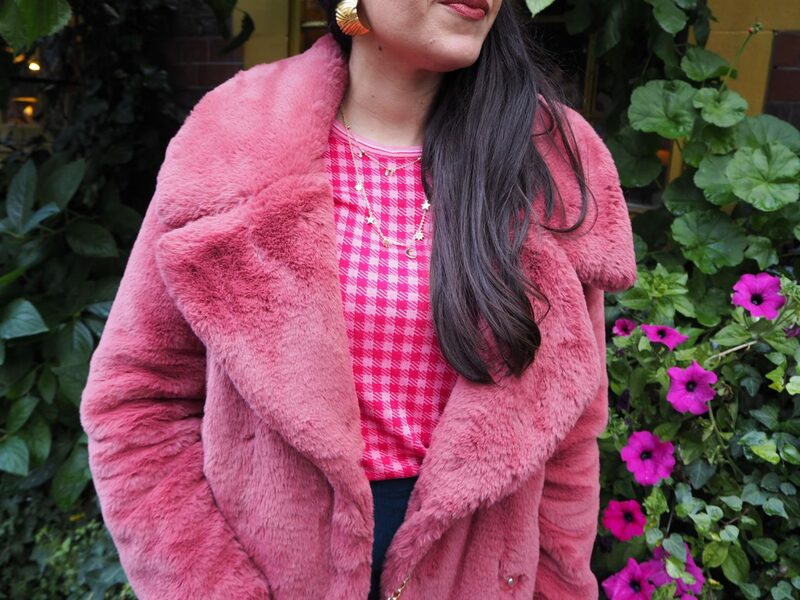 I hate the cold but I love having cute pieces that help me fight against it – hopefully I’ll be finding a few more failsafe outfits for when the temperatures seriously drop. Picture taken by Covent Garden, central London, on October 28th, 2018.